A very limited amount of tickets will be available for sale at the following check-in locations (THE EXCHANGE or BRAVO BRAVO) between 12pm and 5:30pm for $40. Tickets will be sold on a first come, first served basis. Bust out your best costume and get ready for a spooktacular party like none other this season. 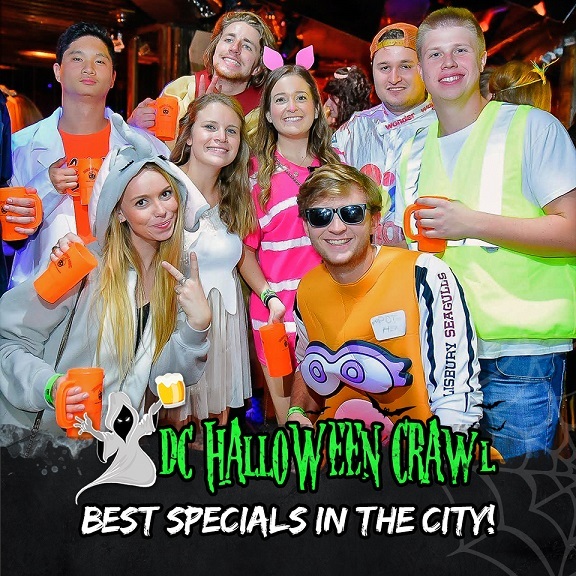 The official DC Halloween Crawl celebrates the scariest time of the year with thousands of your closest friends! What You Get: A souvenir haunted mug, cover-free access to Dupont’s best bars, exclusive drink & food specials, free pictures of the event and a raffle entry to win great prizes. Participating Bars: District Anchor, 1831, The Madhatter, Ozio, Sign of the Whale, Recessions, Cafe Citron, The Front Page, The Bottom Line, Manor, James Hoban's, Bravo Bravo, Meeting Place, The Exchange, and more bars to be announced! Dress Code: We recommend wearing your spookiest, scariest, or most creative costume! There will be costume prizes for the most festively dressed participants. 2) I voluntarily, knowingly and freely assume all risks associated with attending the DC Halloween Crawl and entering the premises, including, but not limited to, my own actions or inactions, injuries, illness and contact with others.